Roy Cady is a bag man for a New Orleans mobster. On the same day as he’s told his lungs are full of tumours he’s asked to go with a colleague to perform a shakedown. Only the set-up feels all wrong. His instinct that he is the potential victim proves true and after a short melee of violence the only two people alive are Roy and a young prostitute. Realising that Raquel (Rocky) will receive the same treatment as the others if left behind Roy takes her with him, heading for Galveston. On the way they pick up Rocky’s young sister. Hiding in a motel by the sea, Roy knows the best way to survive is to ditch the two girls, but somehow he feels compelled to try and keep them out of harm’s way. However, that’s easier said than done. 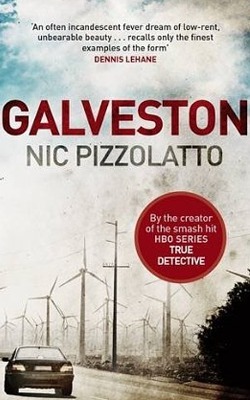 Galveston is a story in the classic noir mould – a dangerous man, whose life is immersed in violence and crime, seeks redemption trying to save a young woman and small child knowing that he will probably reap the consequences of his actions. Despite the well-worn set-up, Pizzolatto provides an entertaining, edgy read that is lifted by very strong characterisation and engaging prose. The plot revolves around the interaction of Roy Cady, a forty year old bagman who’s just been told his lungs are full of small tumours, and Rocky, a young, naïve prostitute who has little conception of how to make it in the world other than to sell her body. Both have troubled histories and despite being ill-matched nurture an uneasy friendship. A key plus in the telling is that Pizzolatto places a strong emphasis on character development and their personal journeys as much as on the plot and their flight from the New Orleans mob. The result is a thoughtful noir tale that doesn’t pull punches, mixing hope with despair, violence and pathos, and has a nice twist in the denouement.